These Heart Shaped Breadsticks are a super simple way to add some festive flair to your Valentines dinner. Store-bought crescent dough and a few simple ingredients are all you need. Are you into all the festive foods for holidays? I’ve always loved a holiday themed dish but even more so now with kids. It just makes the holiday that much more fun. We usually celebrate Valentines with the kids with a big, heart shaped pizza. And what better way to start that meal then with heart shaped breadsticks?! It’s a holiday so fun shaped foods and carbs on carbs is totally acceptable. 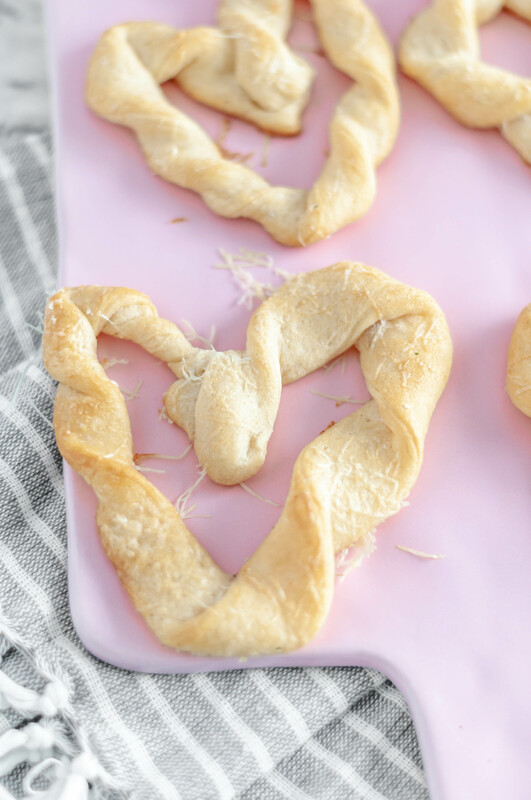 These heart shaped breadsticks start with store-bought crescent roll dough. I love the stuff you can get that’s just a sheet of the dough instead of the perforated rolls. If you can’t find the sheet of dough you can press together the seams and follow the recipe as stated. So first, cut the dough into 1/2-inch strips. Then pick up each end and twist, twist, twist. Then pull up each end to make them into a heart shape. Then they of course need to be brushed with melted butter. I sprinkled mine with garlic salt and freshly grated parmesan cheese. You can use additional herbs like basil and thyme to spice them up even more. They are great dipped in pizza sauce if you are eating them as an appetizer or you can serve them alongside your favorite soup for dunking. You always need a sopping up bread situation when it comes to soup. If you need more festive Valentines foods, check out this fun recipe. And this one too. Heart Shaped Breadsticks are a simple way to add some festive flair to Valentines. Store-bought crescent dough & a few simple ingredients are all you need. Preheat oven to 375 degrees F. Line two baking sheets with parchment paper or spray well with nonstick spray. Set aside. Unroll crescent dough. Cut into 10 1/2-inch strips (lengthwise so they are long). Grab each end and twist the dough. Press ends together and form into a heart shape. Place on baking sheet. Continue until all strips are formed. Mix together melted butter and garlic salt. Brush each breadstick with the butter. Sprinkle with shredded parmesan. Bake for 10 minutes, or until golden.